The macula is located in the center of the retina which is the light-sensitive layer of tissue in the back of the eye. Some Macular Dystrophies do affect younger individuals but generally, this term refers to age-related macular degeneration (AMD). Macular degeneration is the most common cause of severe vision loss in people over the age of 60. AMD is a painless condition and few patients diagnosed with AMD experience total vision lost. If you are at risk, the following steps may help prevent the disease from occurring: smoking cessation, exercise, weight control, blood pressure control, sun protection, proper nutrition, and yearly eye examinations. 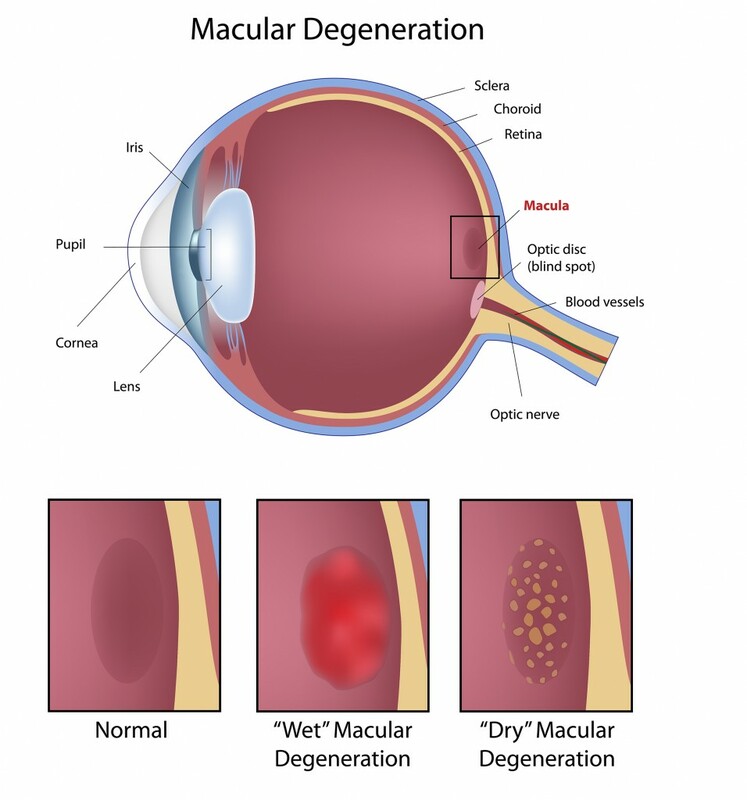 An evaluation by an eye doctor can help you determine if you are experiencing either dry or wet macular degeneration. Each of these conditions are treated differently and may require vitamin supplementation or specific medications to slow or reverse the disease process. Eating foods healthy foods like fresh fruits and vegetables, lean meats and fish, eggs, nuts and seeds are recommended. If you have any of the listed risk factors or are experiencing symptoms of macular degeneration, please contact us today so that we may set up an examination for you.